I decided to study International Business because I want to work for a company by developing relationships with partners and clients from across the globe. As much as that would be my dream job, employers need to know that I won’t make a fool of myself if I don’t know the customs and cultures of a country’s business practices. In order to help myself and you as well, I’m going to show you the right track when planning to meet with a foreign client or partner. Let us start with the obvious: you must learn the protocol and etiquette of the country. One great website to use is Kwintessential. This site allows you to learn the language, culture, and etiquette for personal and professional visits. When planning for a visit, always make sure you know how to greet the person properly. For example, in some Asian cultures, bowing is considered the professional way to greet business partners. In other cultures, it is also customary to exchange gifts upon a first meeting. Be sure to know what kind of gifts are appropriate. 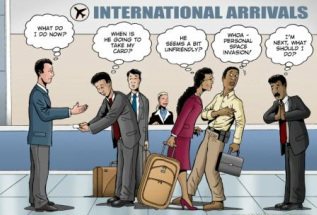 Conversation flow can also vary in different cultures. As Americans, we often like to be direct and get to the point in business meetings. Whereas in other cultures, it is common for the meeting parties to begin with light conversation before getting down to business. The next step is to learn about the culture and customs of the nation. Read books and articles about the history of and current events in the country. Find out about popular cultural highlights to potentially use as conversation starters. For example, baseball is a very popular sport in Japan, while soccer (football) is huge in Brazil. One way to impress the people you are doing business with is learning the native tongue. You don’t have to become fluent, but learning the basics shows appreciation towards said person and his/her country. If you are doing business with someone who does not speak English or very little, make sure to have a translator present to help. By remembering these tips, you're on your way to becoming a successful business man or woman abroad!